Once the stuff of science fiction, robot domestic helpers are fast becoming a reality thanks to developments in artificial intelligence and robotics. 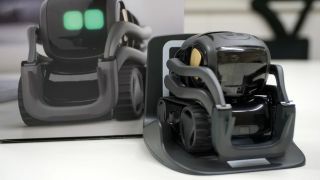 And now leading robotics company Anki has unveiled Vector, a droid with a personality that’s set to take over your home, much like its little brother Cozmo took over your desk. Having released the best-selling toy robot Cozmo in 2016, the company has moved on to service robots while retaining its focus on injecting personality into its creations. Using an HD camera, four built-in microphones and intelligent sensors, Vector is able to understand its surroundings and carry out simple tasks around the home. The new robot is fully autonomous and always on, meaning that all you have to do is say “Hey Vector”, and it will be ready to respond to a command. Some of things it can do include telling you the about the weather, responding to questions, setting timers, and even dancing when it hears music. What sets Vector apart from other domestic robots is its vast capacity for personality; for example, it responds to human touch and can learn the names of the people it sees, and with a hi-res color IPS display, it’s programmed with hundreds of different animations to communicate how it’s ‘feeling’. While Vector is already pretty smart, thanks to regular updates sent via the cloud it will only get smarter over time. Vector is available to order in the UK now through anki.com for 30 days at a special pre-order price of £199.99, and will go on general sale on October 12. In the US it’s available through a 30-day Kickstarter campaign at a special price of $199.99 vs $249.99 (plus taxes), offering early access to both robot and SDK (system development kit).